Drishyam – The movie which turned out to be the peerless investigational thriller turned 4 years recently on 19th Dec 2017.Drishyam turned out to be another successful venture for Jeethu Joseph and Mohanlal the acting maestro hits the bullseye once again with his natural acting. Drishyam was picture perfect in every sense.The casting department proved out to be simply the best in every aspects.Mohanlal as George kutty has been a visual treat for the masses.One will never see Mohanlal but they will indubitably see how unpretentiously a normal Keralite lusts his family more than anybody else.Kamalhassan indubitably gave healthy race for mohanlal in the Tamil remake but at the end of the day Mohanlal outplayed the opponent and made it clear that why he is still considerded as one of the best actors Indian cinema ever produced. The antagonist Sahadevan who was the best pick by Jeethu as it validated to be carrier best performance of Shajon.When you are acting with Mohanlal ,it requires an extra bone in order to grapple with the legend but Shajon doubtlessly proved out to be a tough opponent for Mohanlal.The scene when “The Cows body has been dug from the pit and one of the men shouting from the back ” Kill Sahadevan”. These voices permeated to the unimpaired people who were watching the movie. Coming to the technical Brilliance – Sujith Vasudev who was stunning with the visuals and the climax portion has been captured with sheer Perfection.Jeethu Joseph was undoubtedly the Soul of the movie and let’s wait and watch how he is going to Launch Pranav Mohanlal through Aadhi. 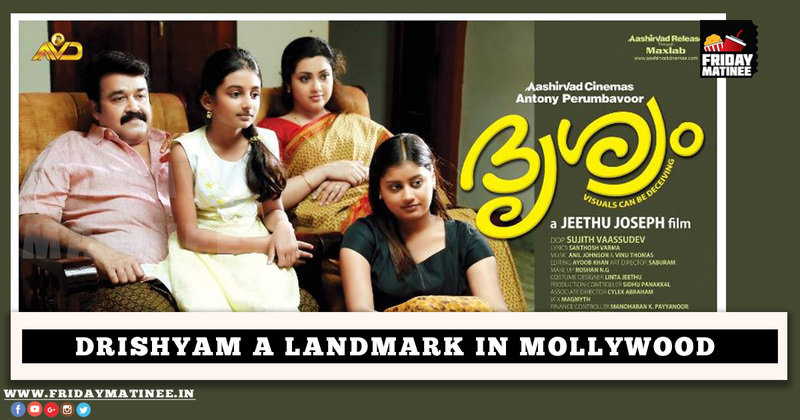 Drishyam being the First ever 50 Cr movie of Mollywood stood up with head held high.Drishyam was one such movie who subsidized in raising the bar for Mollywood in terms of extending the market in the international arena.Drishyam was destined to break records worldwide and one of the notable Chinese Film production company acquired the rights of Drishyam. Pulimurugan may be the first and foremost 100 cr of Mollywood but Drishyam will perpetually linger as the best in terms of rich content, Mastercraft direction, and Mohanlal’s Acting par excellence. Previous articleSuperStar’ s Cameo in Kochunni :Mohanlal or Surya?